Thank you to Emily Tipper for this fantastic summary of your wonderful time in Costa Rica! This summer I was lucky enough to spend 2 weeks in Playa San Miguel working with Olive Ridley turtles. The experience was unforgettable and so different to other holidays that I’d been on because I really felt like I was doing something worthwhile to protect a threatened species. When I arrived, the nests were just beginning to hatch so I saw loads of hatchlings: one night I helped release over 250! 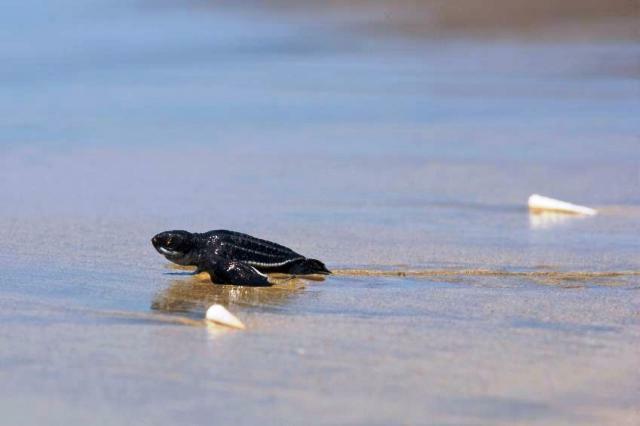 They look so small and helpless: it’s a miracle any of them survive in the ocean. At times it was tough waking up at 2am to check the hatchery but the feeling of satisfaction I got once I had made sure all the hatchlings had made it safely to the ocean made it completely worthwhile. I didn’t see my first turtle until my second week, but the waiting made the experience extra special. It was amazing to watch her crawl up and dig out her nest and I caught the eggs as she laid them before carrying them to the hatchery. We also tagged and measured her, and all the data collection is really worthwhile if we are going to conserve this species. In total I saw 5 turtles nesting and each experience was magical! The project leader and research assistants were so knowledgeable that by the end of my stay I knew much more about the turtles, their life cycle and threats to the species. Our accommodation was located right on the beach. It really was paradise with palm trees, colourful flowers, birds and insects and golden sands. The beach was so quiet that most days we felt like we had it all to ourselves! Marbeth and Graciela cooked delicious meals, and the local kids often visited to chat, play games and learn English. 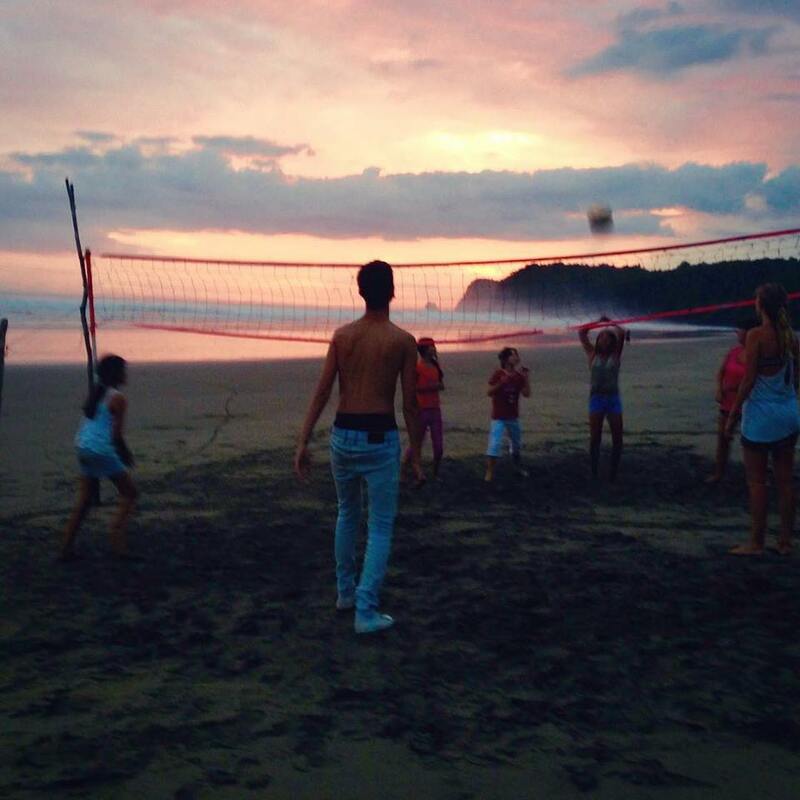 Every evening we would play volleyball on the beach with the rest of the community, and it was fun to chat and learn about their culture whilst improving my Spanish! A definite highlight for me was the visit to the butterfly farm: Mike is so knowledgeable about all the wildlife in the area so I learnt a lot and the jungle habitat was beautiful. He also keeps bees and grows coconuts so we could sample the honey and try out coconut oil soaps and lip balms. We also went to visit the tourist town of Samara, about an hour’s drive away along winding jungle roads. Samara had a beautiful long sandy beach, perfect for swimming, as well as restaurants, shops and stalls selling clothes and jewellery. On my last morning we hiked to a huge waterfall which was amazing: showering under the cool water was definitely needed after a hot and sweaty hike! Day trips were quite difficult to organise so most days we were based at the project site. We swam in the sea, sunbathed, chilled in a hammock with a good book or walked to the estuary and tide pools. All the volunteers were so nice and I made lots of new friends – it was great to be surrounded by like-minded people. I would highly recommend this trip as there is a perfect balance between amazing hands-on conservation work and time to relax in paradise! Costa Rica is a beautiful country and I fully embraced the ‘Pura Vida’ lifestyle. I would recommend going for at least 2 weeks if possible to increase your chances of seeing turtles and to make the most of everything the area has to offer.